The latest monthly QV House Price Index shows that nationwide residential property values for September have increased 14.3% over the past year. Values rose by 4.9% over the past three months and are now 49.5% above the previous market peak of late 2007. When adjusted for inflation the nationwide annual increase drops slightly to 13.8% and values are now 27.0% above the 2007 peak. The average value nationwide is $619,660. The Auckland market has increased 15.0% year on year and 5.8% over the past three months. Values there are now 88.7% higher than the previous peak of 2007. When adjusted for inflation values rose 14.5% over the past year and are 60.2% above the 2007 peak. The average value for the Auckland Region is $1,031,253. 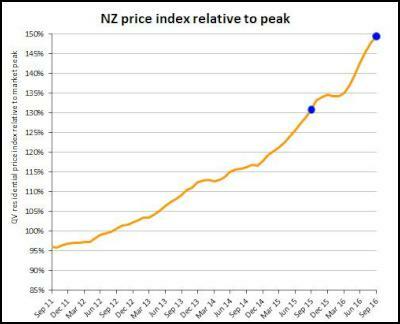 The full set of QV House Price Index statistics for all New Zealand for September can be downloaded by clicking this link: QV House Price Index (HPI) for September 2016. Home values across the Auckland region have continued to rise over the past three months however there are early indications the rate of growth in the market is starting to slow in that the annual growth has slipped back 0.9% over the past month. 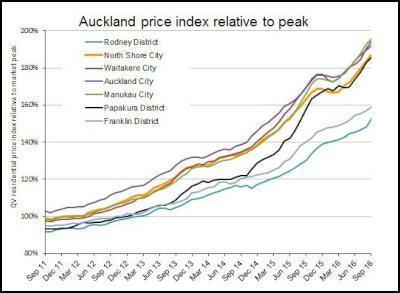 The former Auckland City Council central suburbs have increased by 13.0% over the past year and 4.2% over the past three months .The average value there is now $1,194,608. Values in the former North Shore City suburbs also rose 14.8% year on year and 6.3% over the past three months and the average value there is now $1,207,974. Manukau suburbs were up by 17.5% year on year and 6.4% over the past three months, the average value there is now $895,932. Waitakere City rose 14.5% year on year and 6.9% over the past three months. The average value in the western suburbs is now $824,528. Home values across Hamilton City have risen 27.1% year on year and 7.5% over the past three months. The average value in the city is now $529,236. 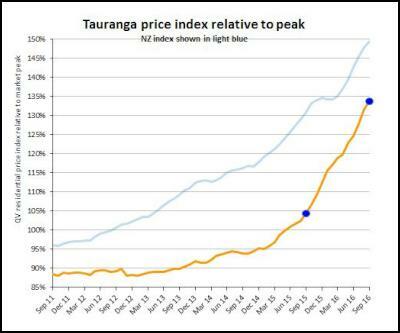 Despite a slowing of activity and demand in the Tauranga market over the past month, home values in Tauranga City are still showing strong value increases over the past year, up 28.1% in the year since September 2015. Values have also risen 7.4% over the past three months. The average value in the city is now $644,297. Western Bay of Plenty home values have risen 29.3% year on year and a huge 9.2% over the past three months. The average value in the district is now $574,993. 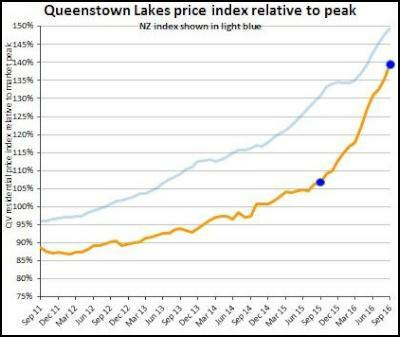 The QV House Price Index for the wider Wellington region shows home values rose 21.2% year on year and 7.1% over the past three months and values are now 21.4% higher than in the previous peak of 2007. The average value across the wider region there is now $553,023. 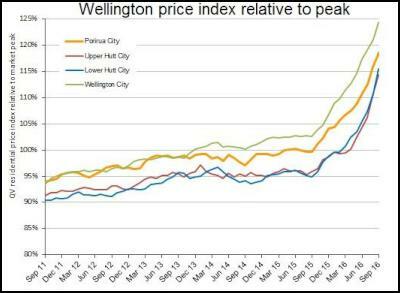 Home values in Wellington City suburbs rose 21.2% year on year and 5.9% over the past three months. The average value there is now $661,927. Lower Hutt rose 21.8% year on year and 9.6% over the past three months while Upper Hutt values were up 19.2% year on year and 9.6% over the past three months; Porirua also rose 19.0% year on year and 7.0% over the past three months and the Kapiti Coast was up 16.5% year on year and 6.3% over the past three months. 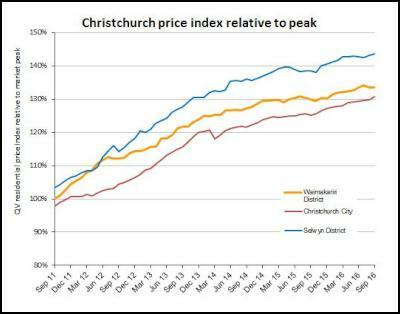 Home values in Christchurch City increased 4.4% year on year and 0.9% over the past three months and they are now 30.7% higher than the previous peak of 2007. The average value in the city is $495,723. Values in the Waimakariri District have risen 2.8% year on year and the average value there is now $427,804; while values in the Selwyn District are up 3.7% year on year and the average value there is now $535,873. 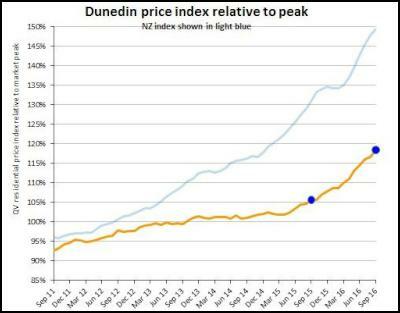 The Dunedin city home values have risen 12.1% year on year and 3.5% over the past three months. The average value in the city is now $339,201. 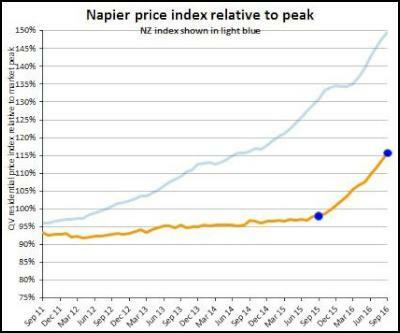 Napier home values continued to see strong growth rising 18.1% year on year and 5.6% over the past three months. The average value in the city is now $393,672. 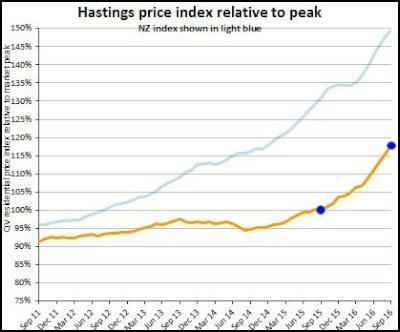 Hastings values are also rapidly rising up 17.8% year on year and 6.3% over the past three months. The average value there is now $367,227. 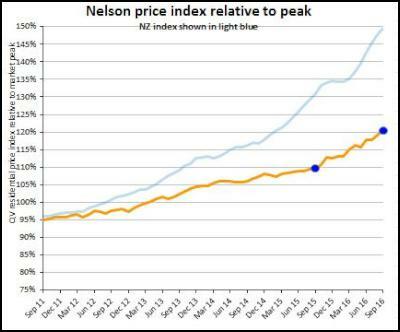 Nelson home values have increased by 14.1% year on year and 3.5% over the past three months. The average value in the city is now $476,817. Values in the city are now 24.5% above the previous peak of 2007. The Tasman District also increased by 11.4% over the past year and 4.2% over the past three months and the average value in the district is now $475,427. 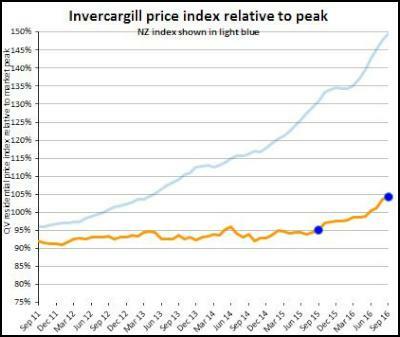 In the North Island, strong growth in the Tauranga market appears to be spreading further south down the east coast to centres such as Opotiki. Opotiki values have risen 24.8% over the past year and 9.2% over the past three months after a long period of little value growth, and Whakatane which is up 22.0% year on year and 4.5% over the past three months. In the South Island, the Central Otago market continues to go from strength to strength spurred on by growth in the Queenstown Lakes District. Values in the Central Otago District have risen 20.6% year on year and in the MacKenzie District is up 22.3% year on year, while the Marlborough District also seems to be benefitting from the strong market in Nelson and Tasman, with values there up 13.7% year on year and 5.8% over the past three months. Find more from Quotable Value New Zealand on InfoPages.